Lynn Pratt is one of the pioneering self-builders at Graven Hill, featured on Channel 4’s Grand Designs The Street. Previously living in a 250 year old cottage when she had the idea, she applied, along with her neighbours Terry and Olwen, to join another 8 intrepid self building households on an epic mission to build their own homes and create a brand new street. If you missed the programme, you can download it here. Graven Hill is the first mass scale self-build homes development in the UK where up to 1900 new homes will be built over 10 years on a rural site with excellent transport connections just outside Bicester. Lynn’s house has been one of the first to be built there, and she has chosen a highly contemporary and individual design by Adrian James Architects. 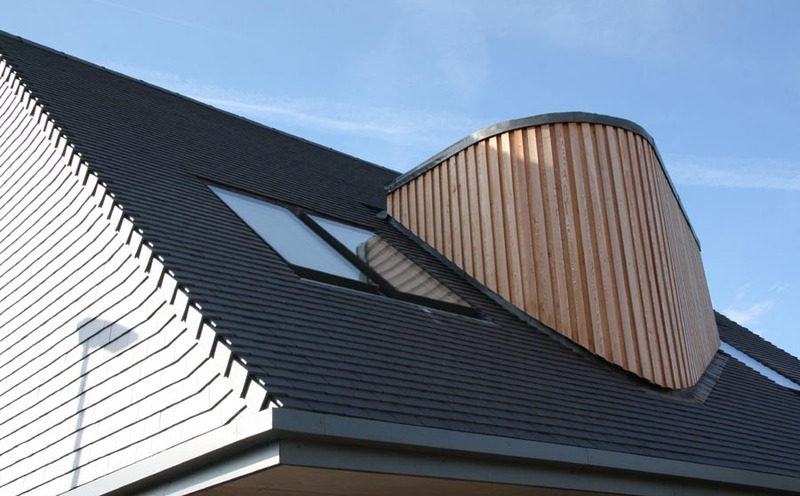 Staffordshire Blue plain clay roof tiles clad the outside of the house from the roof all the way down to the ground. 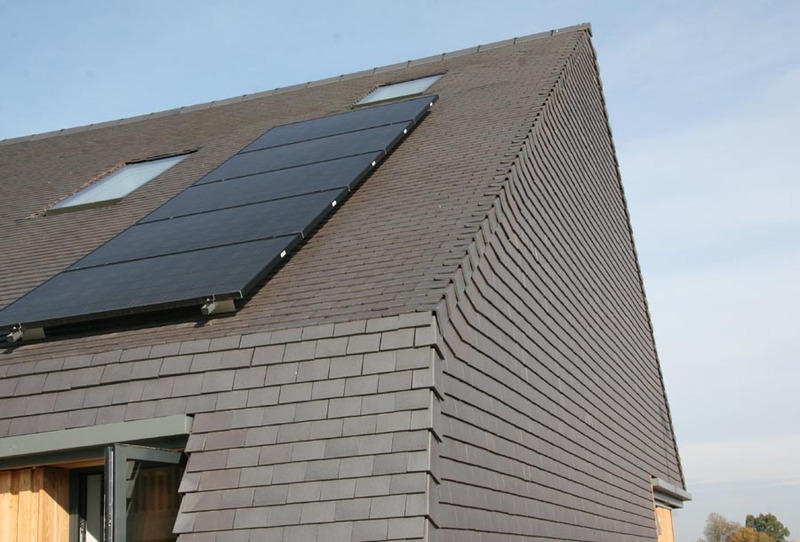 The tiles literally wrap around the exterior, with the edges handled neatly by the use of cloaked verges and mansard tiles make the transition from the roof to the walls. 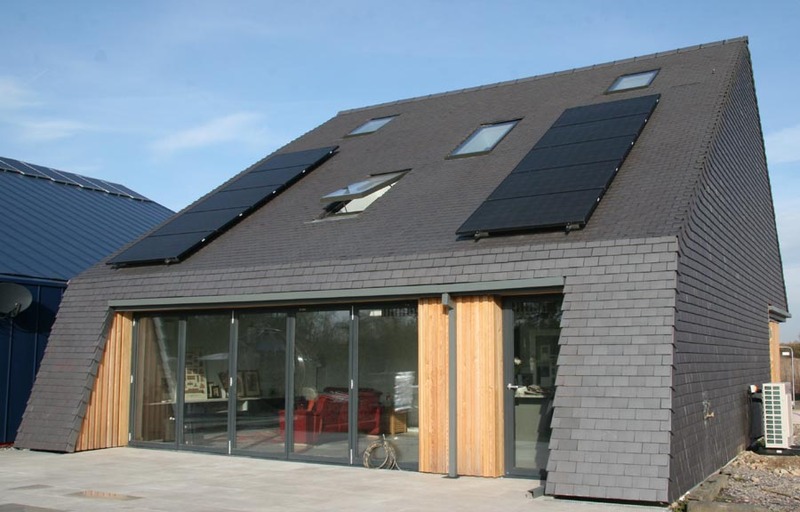 While Dreadnought’s plain clay Staffordshire blue tiles are a traditional building material, Adrian James Architects have used them on a number of highly contemporary self build projects. Their natural colour is derived in the kiln by controlling the atmosphere so that the iron content in the clay turns blue. This process produces beautiful organic shades of natural colour with tonal variations that bring character and texture to the roof. A timber roundel, accommodating Lynn’s ensuite shower extends from the tiles on the front elevation, reminding Lynn of her childhood in Kent and the conical roofs of the oast houses there.